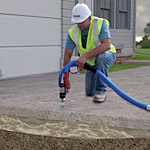 If you have noticed sinking concrete near your home, call us today for a free estimate! 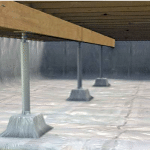 We have lasting solutions for waterproofing your basement. Create a healthier living space and save on your utility bills. Transform your basement into a space you can't live without. Woodford Bros., Inc. offers expert structural and foundation repair, crawl space repair and basement waterproofing services. As a local, family-owned business, our focus is on helping you maintain a secure foundation and a safe home, which is why we give them you the personalized service you deserve. We are known for regularly repairing buildings that other contractors said were beyond all hope. We specialize in foundation straightening, hydraulic lifting systems, foundation replacement, tension rod systems, foundation lifting, structural moving, structural cabling, floor and roof leveling, beam repairs and replacement, as well as pneumatic lifting systems. We also provide basement waterproofing, crack repair, basement flooding repair, crawl space repair, crawl space encapsulation, crawl space support jacks, crawl space waterproofing and more services for basements and crawl spaces. 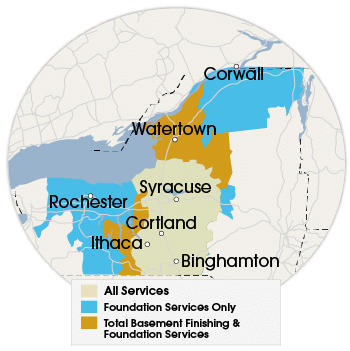 If you need foundation repair in Rochester, Binghamton, Syracuse, Utica or nearby call us today. We provide free inspections and no-obligation, no cost estimates. 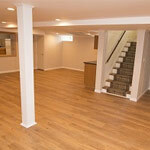 We offer proven solutions for wet and flooded basements. 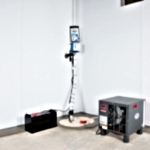 Reduce the radon levels in your home with our state-of-the-art radon mitigation systems. Create healthier living space and save on your utility bills. Woodford Bros., Inc. has been helping residential and commercial businesses in New York for over 50 years. We have been involved in over 50,000 foundation repair projects. We take pride in providing permanent, cost-effective solutions when others might just say “tear it down.” Our foundation specialists use exclusive, warranted foundation products and are extensively trained. 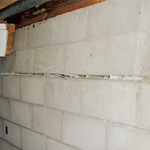 They have the experience, expertise, and tools needed to permanently fix your foundation. We work in structural renovations to failing residential and commercial foundations. This includes solutions for foundation wall straightening, bowing and buckling walls, settlement and sinking, tilting chimneys, and slab raising. We also work on failing retaining walls and problem drainage areas. We offer a Free Estimate for all of our foundation services, including foundation wall straightening, settlement repair, and stabilization. We proudly serve all of Central New York including Utica, Binghamton, Rochester, Syracuse, Ithaca and surrounding areas. Pleased with work and professionalism. "Did an excellent job!...Polite, efficient and a pleasure to deal with." hey explained and did the right work. Woodford Bros., Inc. is New York’s premier Supportworks, Basement Systems and CleanSpace dealer, which means we are able to provide our customers with industry-leading repair products. 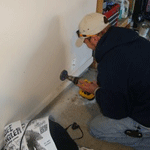 We install warrantied products, proven to restore and repair foundations, wet basements and musty crawl spaces. We straighten walls, fix bowing and buckling walls, repair settling foundations and straighten tilting chimneys.